A superhero experience for your children that will last a lifetime. KidTown Melbourne is all about exciting things to do in Melbourne with your children. We like nothing more than to share articles on KidTown Melbourne that encourage you to "collect memories, not things" with your family. Imagine our delight when we heard about Real Life Superheroes Photography; a collaboration between Melbourne photographer Sandra of Sandra Lee Photography and digital creative Matthew Cook of MJC Creative Images. Real Life Superheroes Photography offers your children the opportunity to pose as a little superhero, after which the images are creatively manipulated to transform them into a Real Life Superhero; a piece of art that will last a lifetime. "Our sessions include beautiful lighting and highly skilled digital work to create the sense of “realism”. - Mat of MJC Creative Images. Book your child a studio session with Sandra and Mat via this page. Due to limited availability, you may be looking at weekdays rather than weekends. You and your child decide on the superhero best suited/most loved, and discuss your preferences with Sandra. There is a selection of outfits available to borrow, but if your requirement is an uncommon superhero, you may need to source your child's costume. Travel to Caulfield for your booked studio session. On the day of your booked photography session, you arrive at the in-house studio in Caulfield where you and your little superhero are welcomed by Sandra and Mat. Both photographers make you and your little one feel more than welcome and comfortable. The session itself takes approximately 45 minutes, which also includes a run down and examples of what's in store after the images are put to the creative touch. Wait for your final image. The waiting game is the hardest part, but also the most exciting. The turnaround time from photoshoot to final piece is 2-3 weeks, due to the time that goes into the detailed composite. You are invited back to the studio to view a print of the final composite. Imagine your child's face, seeing themselves portrayed as a Real Life Superhero! At this point you decide which particular size and style you would like printed, or if you would like to discuss any potential changes. Wait for the arrival of your Real Life Superhero Masterpiece. Another 2-3 weeks and you will be able to take home your Real Life Superhero print, ready to mount on your wall at home for all to admire. We absolutely love our boys' final compositions. We managed to get both boys together as well as individual shots to get the final images you see here. I will mention that Mr.3 is a little young for a Real Life Superhero photo shoot; the age recommendation is usually 5yrs. Reason being, younger children may have a little difficulty following instructions to get into the right position. That said, Sandra and Mat managed to get a great shot of Mr.3. If your own child is under 5, that's not to say it isn't possible to book in a Real Life Superhero shoot; discuss your circumstances with Sandra first. 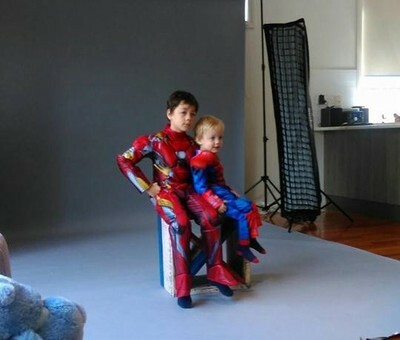 Want to book in a Real Life Superhero photo session for your child? Of course you do! The good news is, if you mention KidTown Melbourne when you make your booking, you get the photo session done for free (usually $150). Final framed wall art composites start from $450. Thereafter, reprints, posters and digital images are available at a reduced rate. Why not chip in with family members, or perhaps ask friends to put some money toward a birthday gift for your child's Real Life Superhero moment. We can't recommend it enough. Complete the online enquiry form for your child's Real Life Superheroes photography session HERE. You can also follow all the latest Real Life Superheroes news on Facebook.